I have always been enchanted by those anatomical engravings in which a partially or completely flayed corpse carelessly cavorts in the great outdoors. Often, the specimen stands in front of some bucolic scene or large animal. 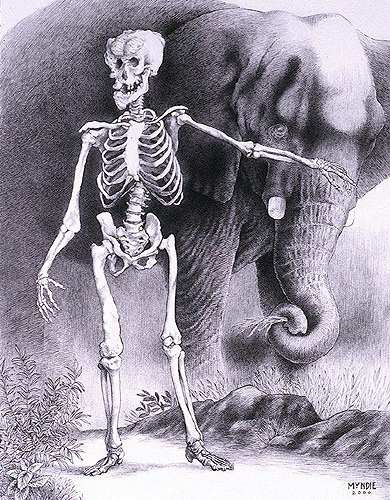 The Jan Wandelaar engraving after Albinus which features a skeleton standing incongruously before a rhinoceros inspired me to depict the remains of the famous Joseph Merrick, known more commonly as “the Elephant Man.” The choice of featuring Merrick's remains seemed natural; after all, since the late Michael “King of Pop” Jackson allegedly tried to buy them Merrick's bones are now nearly as famous as he was. Merrick's skeleton resides in the collection of the Royal London Hospital, where it is still a source of research. The hospital displays a replica skeleton in its museum.